The holidays are just around the corner and what does every woman wish for at Christmas? A little love and plaid perhaps? 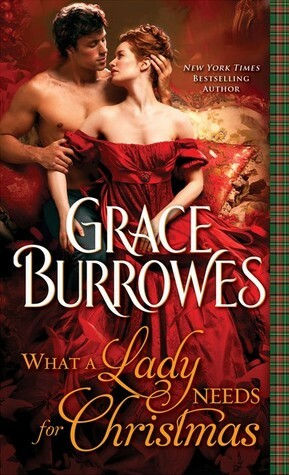 Well in Grace Burrow’s holiday romance, What a Lady Needs for Christmas, fulfills that wish! I am spotlighting this wonderful holiday romance for my readers and this spotlight also includes a fantastic holiday giveaway for an iPad mini! Be sure to enter the Rafflecopter giveaway at the end of this post! To escape a scandal, Lady Joan Flynn flees her family’s estate in the Scottish Highlands. She needs a husband by Christmas, or the holidays will ring in nothing but ruin. I have included an except here to tease you with…..
Lady Joan Flynn needs a husband—any husband—if she’s not to find scandal and mischief under her Christmas tree; Scottish wool magnate Dante “Hard-hearted” Hartwell needs an aristocratic wife to gain access to the financing that will keep his wool mills secure. Can holiday magic spin an expedient match into true love, and wary differences into trust? Joan stretched out her chilly foot, and encountered Dante’s calf. His bare, warm, hairy calf, because her husband slept without the benefit—or hindrance—of clothing. “You’ve given me your very name. That’s gift enough.” Also his trust, his respect, his kisses…so many treasures. He rolled to his back, suggesting Joan had provided the wrong answer. Joan did not want a fine bargain, but she did want the warmth her husband’s body gave off. She yielded to the craving and snuggled right up to his side. His arms came around her, as if they’d spent many nights visiting their way to shared sleep. Joan needed her new husband in so many ways. “Shall I take off my nightgown?” She didn’t want to, but Dante was naked, and the intimacies she’d tried hard not to dwell on were commencing. New York Times and USA Today bestselling author Grace Burrowes’ bestsellers include The Heir, The Soldier, Lady Maggie’s Secret Scandal, Lady Sophie’s Christmas Wish and Lady Eve’s Indiscretion. Her Regency romances have received extensive praise, including starred reviews from Publishers Weekly and Booklist. Grace is branching out into short stories and Scotland-set Victorian romance with Sourcebooks. She is a practicing family law attorney and lives in rural Maryland. No one does romance better than Nora Roberts and one of my favorites is Home For Christmas. I love stories about finding lost love and being set during the most magical time of year makes it even better! I’ve never read any Grace Burrowes, but I’ve been on a historical kick so this looks like a great place to start!